“Quantum Leap” reminds me how God works through us to accomplish good even in small ways. Netflix can be both a blessing and a curse. I call it a blessing because it’s allowed me to sample and experience all sorts of wonderful things. I watched the first five seasons of Dr. Who plus the first two of Sherlock thanks to instant streaming. I was able to finally conquer all of the Star Trek shows ever made because they were all available to me. I even manage to sneak in some educational stuff too, like a great documentary on King Richard III. At the same time, it’s a curse, because when I should be doing more productive things, I know that Netflix is sitting there, just waiting for me to fire it up and get lost in another show, either a new one or an old favorite. Which brings me to Quantum Leap. I still get chills watching that. Love. It. And that’s mostly because I loved this show, this idea of Sam Beckett dropping into people’s lives to make things better. What I always found fascinating, though, was that we never knew for sure why Sam was ping-ponging through space and time. Sure, things went a little “ca-ca” when he stepped in the quantum leap accelerator and vanished, but what kept him popping in and out of these folks? During the series, Sam would attribute his seemingly random time travel to “God or Fate or Time.” Sam never believed that his journey was the result of random chance. He always believed that some sort of cosmic being greater than himself that sent him leaping from life to life, striving to put right what once went wrong. Now here’s the thing: for the majority of the series, we never know what sent Sam a-leapin’. Even if the strange force were “God,” there was no evidence that this particular deity was the Christian one. For all we knew, it was just some nebulous amalgamation of different divinities, all smooshed together into one generic god-like thingamajig. 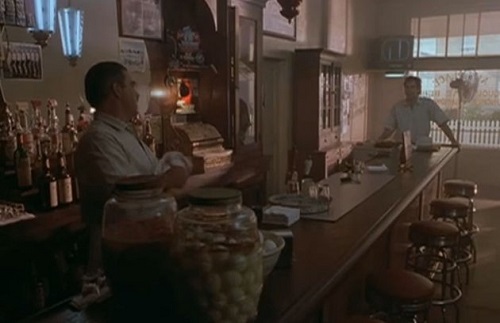 Then, of course, we learned in the finale that God was actually a bartender in what I believe was a Pennsylvania mining town (a fact I can’t confirm because, for some odd reason, Netflix doesn’t have every episode). The less said about that, the better. I’m still a little miffed that Sam never made it home again. But even if God is an overweight suds-slinger, I still see some glimmers of the true God in the whatever-it-was that sent Sam leaping throughout his own lifetime. For starters, there’s his mission to “put right what once went wrong.” Think about it this way: the people involved in the original histories made a mess of things. They did their best but it wasn’t good enough and they wound up creating a sinkhole that consumed their lives and those around them. The only way for them to be lifted out of that morass was for someone else to step into their lives, putting on their frail flesh, and doing what they weren’t capable of doing. In some ways, Sam’s intervention in the lives of others resonates with the echoes of God’s own grace, of His Son becoming incarnate in our fallen world to save us from our sins. … okay, yeah, I may be reaching there a bit. But there is one other thought that’s sort of bouncing around in my brain right now, and that’s how sometimes, Sam’s Leaps included very minor things. Let me give you an example. In one early episode, Sam leaps into a hit man for the mafia. This mafioso was…well, canoodling with the Don’s ex-girlfriend. Part of Sam’s mission is to get the two lovebirds together and the hit man out of the mob. And, due to some rather bizarre circumstances, Sam manages to do just that, interrupting a bingo game in the process. Only he doesn’t Leap out. Flummoxed and unsure of how to proceed, Sam turns to Al, his holographic adviser, for help. Al suggests that Sam take over calling the numbers. He does so and, as a result, the hit man’s grandmother finally wins a game. And that’s all it takes. Sam disappears in a flash of blue light, moving on to take part in what can only be generously described as a rip off of Driving Miss Daisy. That isn’t the only time that Sam’s Leap is dependent, not on big, flashy save-the-day heroics, but on little kindnesses that don’t seem to matter much. Sometimes the fruit we’re called on to bear aren’t huge or flashy. Sometimes they’re so little we won’t even notice them ourselves. But it’s my sincere belief that when we live out our Christian faith, we too will strive to make people’s lives better, to put right what hopefully won’t go wrong. And we keep doing that, knowing that someday, we will leap home. Okay, that was completely over the top, wasn’t it? Sorry. I will say this, though. I’m not quite done with Quantum Leap just yet. Swing on by my personal blog tomorrow morning to see how, if I could, I would reboot Quantum Leap for a new generation. Maybe I should add that to my list of shows to watch.